Remove excess fat from chicken. Remove hard end tips of mushrooms, and cut into halves or fourths depending on size. Destem and remove seeds from peppers; cut into 4-6 pieces if bell peppers are used. Heat a non-stick fry pan over medium-high heat until hot; add chicken skin side down, and cook until skin crisps and turns golden. Turn chicken and cook other side until brown. Add mushrooms and peppers to pan. 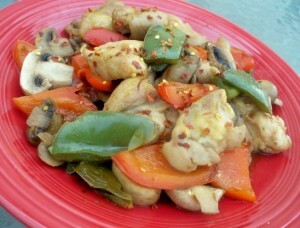 When meat is cooked done, add the mirin and the soy sauce; turn chicken and vegetables frequently. Remove chicken when sauce thickens; cut into bite-size pieces. Arrange all on a platter. Serve sansho pepper and shichimi togarashi as table condiments.